My Website - www.ThomSinger.com is currently down. Don't you hate it when technology fails you? The company who manages my site is working hard to fix the problem, but if you are seeking my site and found this blog, please call me directly 512-970-0398 or email thom@thomsinger.com. Referrals are the life blood of selling. Marketing, social media, PR, advertising, etc... are all great, but in a business world full of noise and self-promotion, few things have as much power as a word-of-mouth referrals. When someone makes an introduction and endorses the sales person there is a higher level of trust that occurs right from the start. 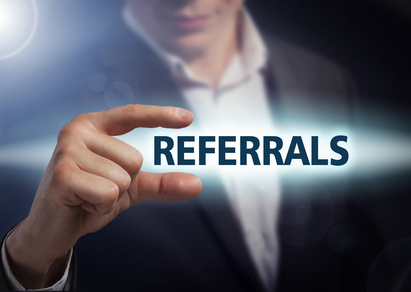 Approximately 90% of my own clients come from referrals. I can do countless other marketing activities (and I do), but the majority of my work is because a person who knows me has told others that I am the right choice to speak at their conference. The problem with referrals is too few people actively take the steps to promote other people. They say they will, and have great intentions, but then they get busy with their own lives and never seem to get around to making the introductions. Thus, those who do talk you up should be treated like gold. We live in an era where self-promotion is at an all time high. Combine that with a high level of competition and everyone is frantically trying to get to their own success. Too few believe they have time to help others, but the most successful sales people often operate in the opposite manner. Some of the best sales professionals I have ever known are always working to connect others, without regard to if there is anything in it for them. They take great joy in being the catalyst that brings others together to do business. Over the long run they develop such a strong reputation of being a giver that people line up to refer work their way. The trick is to make referrals without being worried if others will return the favor. I often run into people who want to keep score and make sure they only refer to work to those who can quickly return the favor. The problem is that not everyone can help at the same level, so pre-judging who to help means you wont help many people. Also there are those who are overly concerned with how to monetize the referrals they give. They are seeking ways to charge commissions rather than just connecting the best resources. Unless you have a business that matches customers and service providers, do not charge a commission. Your long term reputation out weighs any monetary gain you can get from a percentage of an individual sale. The most important thing is to remember to thank the people who send you leads that turn into clients. A "Thank You" is not only polite, it guarantees they will remember you the next time they can send business to someone in your industry. I have had those I connected send me gift certificates or other presents (I got a wonderful Garmin Runner's Watch from one friend whom I referred a client), but I never expect such gifts. I match up people I know will do a good job for the person in need of their offerings. Never forget that sometimes competitors make the good referral partners, too. Depending on your industry, developing long term relationships with others in your field and sharing leads when appropriate is a great way to get more business opportunities. I have created a page on my website of other speakers I know do a great job and I share this link with my past clients, as I know most associations do not want the same speaker year-after-year at their conferences. By providing them with quality speakers I get to stay in touch over the long run (and thus get re-hired in the future), and the other speakers who get booked are more likely to refer me in the future. When people tell me they never get referrals my first question is "how many referrals have you given in the last month that turned into real business?". If they do not know the answer, that is most likely the problem. I can't understand how people who never refer anyone expect others to send them business. While not everyone would (or should) create a link to competitors on their website, you should be promoting your clients, vendors and friends regularly. Finally, if you want to get referrals you have to tell people how much your business depends on their help in connecting you with those who use your products or services. One real estate agent I know has it at the end of voicemail message: "...my business depends on referrals, so if you know anyone looking to buy or sell a home, please tell them about me!" My own email signature has the following sentence: "As a speaker, I am seeking introductions to companies, law firms, and associations that host conferences and team meetings - Thanks!" If you don't remind people that you seek referrals, they probably will not think about it. There are a lot of moving parts to a successful career in sales, but cultivating referral business should never be ignored.